Sure can’t say a whole lot of good about the weather for the weekend. Was pretty miserable; so much wind, rain, and cold temperatures. Sun is supposed to show herself this week and I hope she does. Would feel pretty good. Tom and Cynthia Arnone, Buffalo, NY, recently spent a few days with Roseanne Lukachik. Was a nice time for all. St. Vladimir’s Church is having a Halupki dinner on Sunday, the 30th, Noon to 4 p.m. at the Church Hall. Eat in or take out. Halloween party, the 31st, Pavilion, 6 p.m., refreshments and prizes. Have your porch light on if you’d like kids to stop by. Bob and JoAnn McGuire went on a bus trip to Rochester, NY, on Saturday. They were with some Che-Hanna Rock and Mineral Club members. This was to attend the Rochester mineral club show, held at the Armory. You talk about wind. You think it’s windy here, go to Rochester; you could barely walk from one spot to another. On the return trip, we stopped at Letchworth State Park in Castile, NY. The falls were awesome, with double rainbows and the water was barreling over the falls. Not much nice foliage; the wind and rain had knocked the leaves off the trees and there was no color. But, it was a nice trip to the show and the Park and visiting with friends. Just a reminder to get out and vote on November 8th. It’s your right and your privilege, so just do it. Don’t forget the New Albany Volunteer Fire Co. play is coming up November 12 and 13; 18 and 19. Should be pretty good again this year. Mark your calendar now and plan to attend. Happy belated birthday to Maddie Pochatko who celebrated on the 24th. Hope you had a good day. Guess that’s it. Enjoy your week, it’s to be much more pleasant than what we’ve had, or so I hope. 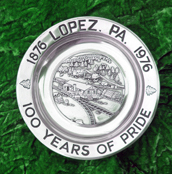 Have news call me at 570-928-9238; mail me; see me; or e-mail me at: news@lopezpa.com. I’ll get it in for you. Thanks for reading and I’ll be here next time.